PYONGYANG, -- North Korea tested what it described as a new type of "cutting-edge" anti-ship missile with its leader Kim Jong Un pictured beaming at the launch, as shown in state media on Saturday. But some analysts are saying North Korea's touted missiles appear to be Russian designs. The announcement of the test also occurs just weeks before the annual joint U.S.-South Korea military exercises, that annually draws colorful rhetoric and promises of catastrophe from Pyongyang. 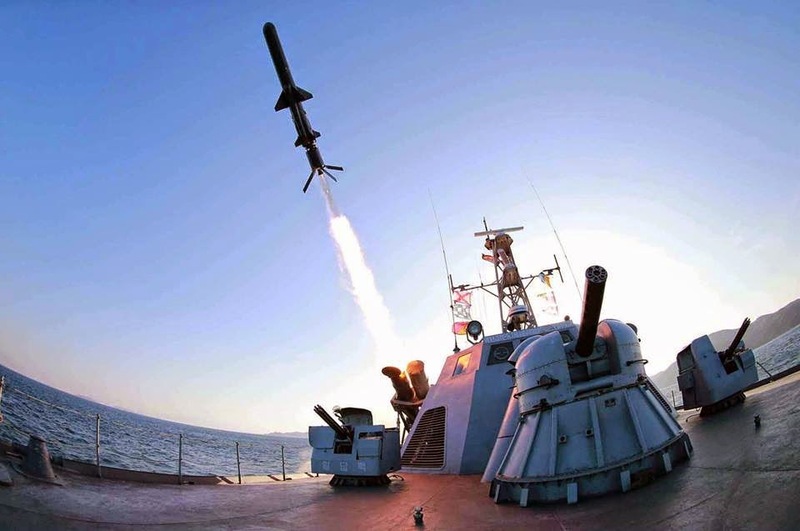 The test-firing took place in the East Sea and the North Korean media boasted that its "intelligent rocket precisely sought, tracked and hit the 'enemy' ship after taking a safe flight." The South Korean Defense ministry said five short-range missiles were fired on Sunday with a range of 200 kilometers (124 miles). The purpose of the new missiles are for North Korea to defend its waters and "strongly react to any attempt of the enemy's fleets of warships for military attack, through close combat or distant combat," according to North Korea's state-run KCNA news agency. North Korean media also showed a beaming Kim standing with military generals who were applauding. It also reported that Kim expressed "satisfaction" over the "highest level" of rockets being developed in North Korea. But that point is being disputed, as one analytical officer wrote the weapon appeared to be a Russian Kh-35E anti-ship cruise missile. "Whether the KPN (Korean People's Navy) acquired the system directly from Russia or a third party is unclear," wrote Joseph S. Bermudez in the North Korea analysis site, 38 North. "Should the new system be successfully integrated into the KPN and widely deployed it would represent a significant step towards redressing the service's obsolescence and increasing the threat poised to South Korean and U.S. Navy vessels in the region." Bermudez also cautioned that this was only a "potential development" as North Korea's military has a "long history of slow and often poor system integration." This year, North Korea has made the usual protestations of the joint U.S.-South Korea military exercises, which it has referred in the past as "joint saber-rattling." It offered a nuclear moratorium earlier this year in exchange for canceling the joint exercises. But the U.S. rejected the proposal, with a State Department spokeswoman calling it a "false choice." Through KCNA, North Korea has since denounced U.S. with its colorful slogans as: "Let's wipe out and annihilate the enemy and give death to him!" and warning that the U.S. "imperialists will face final doom." After the Korean War, which ended with an armistice in 1953, the U.S. has maintained military personnel in South Korea. Based on a mutual defense treaty, the countries have carried out annual joint military exercises between U.S. units and South Korean armed forces, that they say are defensive in nature. North Korea has test-fired a new anti-ship cruise missile. The missile is designated as KN-09 and is believed to be a copy of the Russian Kh-35E.